On Monday, Oct. 16, ECMC will be holding a free Community Health Fair. 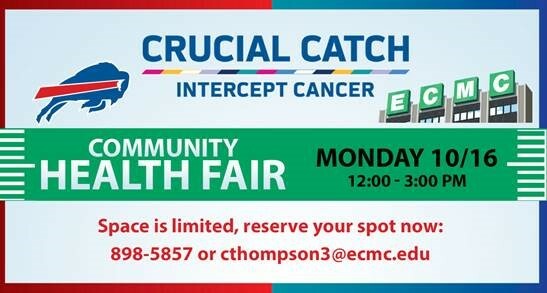 In recognition of the NFL’s “Crucial Catch” initiative, community neighbors are invited to attend the event to Intercept Cancer and Make the Crucial Catch. Located at the second-floor overflow cafeteria in ECMC’s main building, the fair will take place from 12 p.m. until 3 p.m. The event will feature a variety of stations including prostate awareness, cardiovascular health and blood pressure checks, breast health education, dental and oral oncology, hearing exams and much more. Additionally, free flu shots will be available for the first 100 community neighbors to sign up. Guests will also have an opportunity to meet Bills alumni and enter to win Bills tickets! Please note that space is limited and those interested in attending should reserve a spot by calling 898-5857 or by emailing cthompson3@ecmc.edu.